I worked enough today to reward myself with a little knitting. 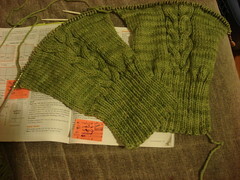 Both of the Central Park Hoodie sleeves are underway. 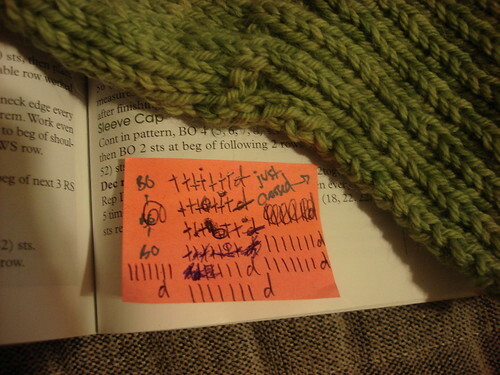 It is my crazy notes on how many rows and increases remain. The eagle-eyed might also notice that for some reason I have indicated the time to increase with the letter d. Makes sense to me for some reason…. Here’s how it goes – once you’re tagged write a short blog post about your favorite word, and what makes it your favorite. Of course you can have more than one! Be as long-winded as you like! Just make sure to copy & paste this text into your post, and tag four friends! CraftyGinger chose a repectable word: luminous. Ever since I was tagged for this challenge a few weeks ago I have had the same word in my head. I tried to pick something literary, serious, insightful or at least descriptive, but I just keep coming back to the same word. Gravy. Why would I claim that my favorite word is gravy? I like gravy. It is delicious. It is the dinner equivalent of the ever-famous dessert mainstay – icing. I think everyone might like gravy. I have never heard someone say “I’ll have the chicken-fried steak, but hold the gravy.” But I am from Ohio. I actually don’t think I have heard anyone other than myself say “I’ll have the chicken-fried steak” since I moved to California. But that is not the point. It makes an excellent pet name and currently holds the top spot and my most-likely-next-pet-name. Give it a try. “Graaaavvvyyy… Come here you little cutie!” Totally works. So what is your favorite word? I am sending tags out to some of my commenters: 5thelementknitr, Amber, Kimchi, and Chris. but, of course if you don’t want to participate (sometimes memes stress me out) no hard feelings, let me know and I’ll tag differently :). 11 Responses to "A little knitting, with gravy." Well, I kind of hate to burst your bubble, but I don’t like gravy. There had to be someone out there, didn’t there? Your CPH is looking great! What yarn are you using? I\’m meme-free, baby – but thanks for the thought! One of my friend\’s named his dog Corn-on-the-Cob, because it was his favorite food at the time. Several years later, he got another dog and he named it Gravy. my husband totally orders chicken fried steak (and he loves the gravy). CPH is looking really good there. Love that you use a “d” for increasing, I think it makes as much sense as anything, let’s face it, an “i” would get lost with the rest of your notes. Gravy! Never thought of it that way! Thanks for the tag, I\’ll post about it soon!